The Iranian languages are a branch of the Indo-European language family and its subfamily, Indo-Iranian. They are spoken by the Iranian peoples. Avestan is the oldest recorded Iranian language. Today, there are an estimated 150-200 million native speakers of Iranian languages. The Ethnologue lists 87 Iranian languages. Persian has about 53 million native speakers, Pashto about 40 million, Kurdish about 26 million, Lurish about 3.3 million, and Baluchi about 7 million. The Iranian language branch is so named because its principal member languages, including Persian, have been spoken in the area of the Iranian plateau since ancient times. However, as a linguistic classification 'Iranian' implies no specific or special relation with the modern country of Iran . To avoid this confusion, the term Iranic is sometimes also used for this branch. Iranian languages are spoken by many ethnic groups including Persians (Tajiks, Farsiwan, Hazara, Aimaq), Kurds (Kurmanji, Sorani), Pashtuns (Abdali, Ghilzai), Baluchi, Goranis, Talishi, Mazandari , Sangesaris, Tati, and Zazas. Together with the other Indo-Iranian languages, the Iranian languages are descended from a common ancestor, Proto-Indo-Iranian.The Indo-Iranian languages are thought to have originated in Central Asia. The Andronovo culture is the suggested candidate for the common Indo-Iranian culture ca. 2000 BC. It was situated precisely in the western part of Central Asia that borders present-day Russia (and present-day Kazakhstan ). It was relatively proximity to the other satem ethno-linguistic groups of the Indo-European family, like Thracian, Balto-Slavic and others according to the reconstructed linguistic relationships of common Indo-European and its original homeland (more precisely, the steppes of southern Russia to the north of the Caucasus). Proto-Iranian thus dates to some time after Proto-Indo-Iranian break-up, or the early second millennium BC, as the Old Iranian languages began to break off and evolve separately as the various Iranian tribes migrated and settled in vast areas of southeastern Europe, the Iranian plateau, and Central Asia. Avestan, mainly attested through the Avesta, a collection of sacred texts connected to the Zoroastrian religion, is considered to belong to a central Iranian group , where only peripheral groups such as southwestern (represented by Old Persian) and northeastern Sogdian and Sakan language (Scythian) had developed. Among the less known Old Iranian languages is Median, spoken in western and central Iran, which may have had an “official” status during the Median era (ca. 700-559 BC). Apart from place and personal names, some report from Herodotus' Histories and some preserved forms in Achaemenid inscriptions; there are numerous non-Persian words in the Old Persian texts that are commonly considered Median. Also some of the modern Western and Central Iranian dialects are likely to be descended from Median. vi(2). Documentation. Others are Carduchi (predecessor to Kurdish) and Parthian (evolving into the language of the later empire). The Western family includes Parthian (Arsacid Pahlavi) and Middle Persian, while Bactrian, Sogdian, Khwarezmian, Saka, and Old Ossetic (Scytho-Sarmatian) fall under the Eastern category. The two languages of the western group were linguistically very close to each other, but quite distinct from their eastern counterparts. On the other hand, the Eastern group retained some proximity to Avestan. They were inscribed in various Aramaic-derived alphabets, which had evolved from the Achaemenid Imperial Aramaic. Middle Persian (Pahlavi), was the official language of the Sassanids. It was in usage from the 3rd century CE until the beginning of the 10th century. Pahlavi and Parthian were also the language of the Manichaeans, whose texts also survive in various non-Iranian languages, from Latin to Chinese. The Imperial Aramaic script used in this era experienced significant maturation. Following the Islamic Conquest of Persia (Iran), there were important changes in the role of the different dialects within the Persian Empire. The old prestige form of Middle Iranian, also known as Pahlavi, was replaced by a new standard dialect called Dari as the official language of the court. The name Dari comes from the word darbar (دربار), which refers to the royal court, where many of the poets, protagonists, and patrons of the literature flourished. The Saffarid dynasty in particular was the first in a line of many dynasties to officially adopt the new language in 875 CE. Dari may have been heavily influenced by regional dialects of eastern Iran, whereas the earlier Pahlavi standard was based more on western dialects. This new prestige dialect became the basis of Standard New Persian. Medieval Iranian scholars such as Abdullah Ibn al-Muqaffa (8th century) and Ibn al-Nadim (10th century) associated the term "Dari" with the eastern province of Khorasan, while they used the term "Pahlavi" to describe the dialects of the northwestern areas between Isfahan and Azerbaijan, and "Parsi" ("Persian" proper) to describe the Dialects of Fars. They also noted that the unofficial language of the royalty itself was yet another dialect, "Khuzi", associated with the western province of Khuzestan . The geographical area in which Iranian languages were spoken was pushed back in several areas by newly neighbouring languages. 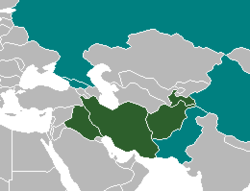 Arabic spread into some parts of Western Iran (Khuzestan), and Turkic languages spread through much of Central Asia, displacing various Iranian languages such as Sogdian and Bactrian in parts of what is today Turkmenistan , Uzbekistan and Tajikistan . Sogdian barely survives in a small area of the Zarafshan valley east of Samarkand, and Saka (as Sariqoli) in parts of southern Xinjiang as well as Ossetic in the Caucasus. Various small Iranian languages in the Pamirs survive that are derived from Eastern Iranian. Roland G. Kent: "Old Persion - Grammar Texts Lexicon". Part I, Chapter I: The Linguistic Setting of Old Persian. American Oriental Society, 1953.